I went to California last week to talk math and machine learning with Ben Recht (have you read his awesome blogstravaganza about reinforcement learning and control?) My first time on the brand-new Madison – San Francisco direct flight (the long-time wish of Silicon Isthmus finally realized!) That flight only goes once a day, which means I landed at SFO at 6:15, in the middle of rush hour, which meant getting to Berkeley by car was going to take almost an hour and a half. So maybe it made more sense to have dinner near SFO and then go to the East Bay. But where can you have dinner near SFO? Well, here’s what I learned. When I was at MSRI for the Galois Groups and Fundamental Groups semester in 1999, there was an amazing Chinese restaurant in Albany, CA called China Village. I learned about it from my favorite website at the time, Chowhound.com. China Village is still there and apparently still great, but the original chef, Zongyi Liu, left long ago. Chowhound, too, is still there, but a thin shadow of its old self. When I checked Chowhound this week, though, I learned something fantastic — Liu is back and cooking in Millbrae! At Royal Feast, a 10-minute drive from SFO. So what started as a plan to dodge traffic turned into the best Chinese meal I’ve eaten in forever. Now I’m thinking I’ll probably stop there every time I fly to San Francisco! And it’s right by the Millbrae BART station, so if you’re going into the city, it’s as convenient as being at the airport. So that got me thinking: what are good things to know about that are right near the airport in other cities? The neighborhood around the airport is often kind of unpromising, so it’s good to have some prior knowledge of places worth stopping. And I actually have a pretty decent list! LAX: This is easy — you can go to the beach! Dockweiler State Beach is maybe 5 minutes from the airport. It’s a state park, not developed, so there’s no boardwalk, no snack stand, and, when I went there, no people. You just walk down to the ocean and look at the waves and every thirty seconds or so a jumbo jet blasts by overhead on its way to Asia because did I mention 5 minutes from the airport? You’re right under the takeoff path. And it’s great. A sensory experience like no other beach there is. I just stood there for an hour thinking about math. BOSTON: There is lots of great pizza in Boston, of course, but Santarpio’s in East Boston might be the very best I’ve had, and it’s only 7 minutes from Logan airport. Stop there and get takeout on your way unless you want to bring yet another $13 cup of Legal Seafood chowder on your flight. MILWAUKEE: I have already blogged about the unexpectedly excellent Jalapeño Loco, literally across the street from the airport. Best chile en nogada in the great state of Wisconsin. SEATTLE: The Museum of Flight isn’t quite as close to Sea-Tac as some of these other attractions are to their airports — 12 minutes away per Google Maps. But it’s very worth seeing, especially if you happen to be landing in Seattle with an aircraft-mad 11-year-old in tow. MADISON: “The best barbecue in Madison, Wisconsin” is not going to impress my friends south of the Mason-Dixon line, or even my friends south of the Beloit-Rockford line, but Smoky Jon’s, just north of the airport on Packers Avenue (not named for the football team, but for the actual packers who worked at the Oscar Mayer plant that stood on this road until 2017) is the real thing, good enough for out of town visitors and definitely better than what’s on offer at MSN. CHICAGO: No, O’Hare is terrible in this way as in every other way. I once got stuck there for the night and tried to find something exciting in the area to do or eat. I didn’t succeed. You guys travel a lot — you must have some good ones! Put them in the comments. Ground lamb from Double Ewe Farm (Arena, WI) bought at Conscious Carnivore, stir-fried with scallions/mushrooms/cabbage/garlic/soy sauce/sesame oil and served on top of shiso leaves from Crossroads Community Farm (Cross Plains, WI) with Hot Mama’s habanero sauce from Belize. I would include a picture of it but it actually didn’t look very pretty. It tasted great, though! A hamburger, black sesame gelato, breakfast (incl. baked beans) at a diner from the 1940s, hand-pulled noodles, poutine. Update: “Related posts” reminds me that the last time I went to a conference in Toronto, I learned a lot of interesting math from Julia Wolf, and the same was true this time! I didn’t have time to do a real shop and had nothing for Friday night dinner so I bought some chicken and a bag of apples and made something that came out surprisingly well; I hereby record it. Get oil hot. Throw apples and scallions in. Stir and cook 5 mins until apples soft. Clear off some pan space and put coriander, cumin, turmeric, salt in the oil, let it cook 30 sec – 1 min, then throw in all the chicken, which by the way you cut into chunks, saute it all up until it’s cooked through. Put the minced garlic in and let that cook for a minute. Then put in however much tomato you need to combine with everything else in the pan and make a sauce. (Probably less than you think, you don’t want soup.) Turn heat down to warm and mix in garam masala. You could just eat it like this or you could have been making some kind of starch in parallel. I made quinoa. CJ liked this, AB did not. I took the spice proportions from a Madhur Jaffrey recipe but this is in no way meant as actual Indian food, obviously. I guess I was just thinking about how when I was a kid you would totally get a “curry chicken salad” which was shredded chicken with curry powder, mayonnaise, and chunked up apple, and I sort of wanted a hot mayonnaiseless version of that. Also, when I was in grad school learning to cook from Usenet with David Carlton, we used to make a salad with broiled chicken and curry mayonnaise and grapes. I think it was this. Does that sound right, David? Yes, that recipe calls for 2 cups of mayonnaise. It was a different time. I feel like we would make this and then put it on top of like 2 pounds of rotini and have food for days. Note to self: this recipe is good. Recipe: Cut (don’t peel) potatoes, roast at 425 for 20 mins with some salt, pepper, oil (I use grapeseed.) 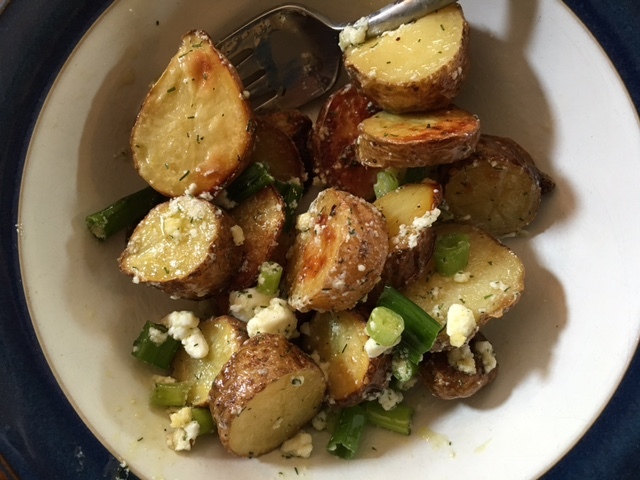 Let cool a bit, then toss with chopped scallions, dill (had no fresh so I used dried), crumbled-up feta, and the best olive oil you have in the house. I’m liking Partanna lately. This is basically taken from the Moldavian Potato Salad recipe in Please to the Table but I like it better with roasted potatoes and without the vinegar. My apologies to the Moldavians.